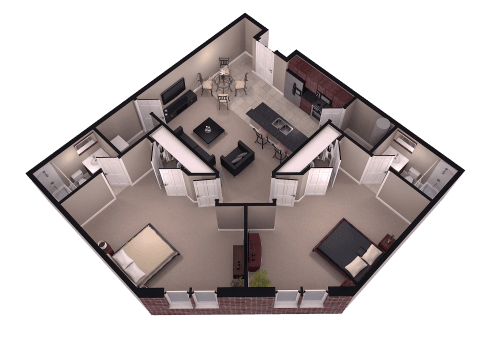 At Midtown by Brookside, you are living just a short walk from the center and excitement of downtown Columbia. The great features of Midtown by Brookside are yours to enjoy. With shopping, restaurants and local markets at your doorstep, you are sure to enjoy your stay both in classes and outside of classes. After a long day, enjoy relaxing at the rooftop pool, take some stress off at the state of the art fitness center or work on making the Dean's list at the study center. Midtown By Brookside is located and 0.36 miles from Columbia College. The property has a Walkscore of 92, so you will be in walking distance of everything you'll need on a daily basis. Midtown By Brookside has many shops nearby. Coffee shops in the area include Starbucks, Panera Bread, The Upper Crust. There are a number of markets in the area include Walmart Supercenter, Hy-Vee, Peace Nook.